We welcome children of all ages to First Avenue Dental. Our goal is to make you feel comfortable and build a relationship that will last through years of oral health. We know it is essential to see our patients regularly in order to maintain your dental health and by extension, your overall health. At First Avenue Dental, we pride ourselves on building positive relationships with our patients, even those that have experienced mild or even severe dental anxiety in the past. We encourage you to visit our office, meet our team, and allow us to care for your oral health in a stress-free environment. Regular visits are essential to maintaining your dental health! We encourage patients to set up a recurring appointment reminder with us to ensure you never miss a cleaning! At First Avenue Dental we use white bonded fillings for repairing tooth decay as well as broken teeth. These white fillings are less noticeable than traditional silver fillings. Dental decay can be uncomfortable, but the quicker we catch it, the easier it is to treat. A regular checkup can identify problem areas so that we can fill small cavities before they become serious problems. If you currently have unsightly, worn-out, or damaged fillings, we can replace them with new fillings or crowns. Ask us how today! Crowns provide long term solutions for cracked teeth, tooth damage and decay. Depending on the location and type of treatment required, we may recommend all porcelain crowns, porcelain fused to metal crowns or gold crowns. Bridges are used to replace missing teeth. They are a permanent solution that is cemented onto your existing teeth, this means there is nothing to take out and clean as would be the case with a partial denture. A root canal is a dental treatment to clean and disinfect the interior of your tooth (the pulp) when it is infected. The clean, hollow canal is then filled with an inert material, sealing the canal off. After a root canal the tooth is at high risk for fracture as the tooth is now hollow. In order to prevent fractures of a tooth that has a root canal, we will typically recommend a crown to distribute occlusal/biting forces more evenly. Dr. Thiessen and Dr. Veason will discuss your options with you if a root canal is necessary. They may perform the procedure in their office, or they may refer you to a specialist for treatment. Emergency tooth pain? Call 306-773-2885 to book an appointment quickly. Dental implants are changing the way we enjoy oral health throughout our lifetime, and offer the most functionally effective and durable option for replacing missing teeth permanently. Dental implants are extremely secure and have a very high clinical success rate. 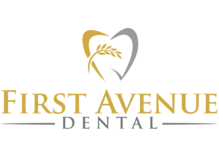 At First Avenue Dental, we perform all aspects of implant dentistry right here in the office, from implant surgery to the final crown, we will take care of you. Once restored, dental implants do require routine examination, maintenance and care to ensure longevity. This dental implant after-care is also provided at our office. Misaligned teeth can lead to issues with periodontal disease, inefficient chewing, speech concerns, as well as decreased esthetics. Traditional braces are an effective treatment for misaligned teeth. Book a consultation with Dr. Veason to see if you are a candidate for braces. We will soon be offering clear aligner orthodontics, which eliminates the need for wires and metal brackets! Please watch for updates on this. Book a consultation with Dr. Veason to see if you are a candidate for braces. Thiessen and Veason advocate saving teeth whenever possible through root canals, crowns or other restorative repairs. In cases where extractions are necessary, however, we work to minimize the discomfort and any anxieties our patients may feel. Ask Dr. Thiessen about surgical options for replacing missing teeth. Mouth guards worn during sleep are effective ways to protect teeth from damage from contact or teeth grinding (bruxism). We design and fit custom guards for comfort so that patients are more likely to consistently use the guard. First Avenue Dental can make a variety of custom mouth guards in a range of sizes and colours. We recommend sports guards for high contact sports or instances when contact between teeth and soft tissue may occur. At First Avenue Dental we offer take-home teeth whitening. We will take impressions of your teeth, create stone models of your mouth, and fabricate trays custom-fit to your mouth that you can take home and use to whiten your teeth when it is convenient for you! We realize that visits to the dentists can be a source of anxiety for patients. For many patients, it is severe enough that it interferes with their oral health. Avoiding visits to the dentist, or avoiding regular dental maintenance can lead to more problems the longer it occurs. At First Avenue Dental, we’ve worked to create an inviting environment in order to address the common causes of dental anxiety. By building a trusting relationship with our patients, and by helping them understand their fears about visiting the dentist, we can better manage your dental care in most cases without relying on sedation. We will take the time to get to know you, to listen to your concerns and to create a treatment plan that takes your concerns seriously. By addressing the root of your dental anxiety, we can work to make your visit as comfortable as possible. In moderate cases of anxiety, Nitrous Oxide (laughing gas) is sufficient to reduce your stress. Both children and adults respond very well to this treatment. In more severe cases of anxiety, a mild sedative can be prescribed and taken at your appointment. Start by scheduling an initial consultation with our dentists to visit our clinic and discuss your concerns in a low stress environment. For those patients whom have severe anxiety or have difficulty sitting through appointments (very small children), Dr. Thiessen offers hospital dentistry. After an initial consultation appointment at our office, an anaesthesiologist at the Cypress Regional Hospital will put you to sleep and Dr.Thiessen will complete any and all dental treatment required. Schedule a consultation with Dr. Thiessen to see if this option is right for you. At First Avenue Dental we realize that toothaches don’t always happen during work hours. To accommodate this, we offer after hours emergency services. Depending on the situation, there may be an additional fee not covered by most insurance plans. Please call 306-741-8568 if you are in need of emergency service. Providing quality care to our patients in a comfortable and relaxing environment. We strive to help you achieve optimal oral health which leads to improved overall health.